The outside rearview mirrors can be adjusted to your preferred rear vision, both directly behind the vehicle, and to the rear of the left and right sides. The remote control outside rearview mirror switch controls the adjustments for both right and left outside mirrors. 1. 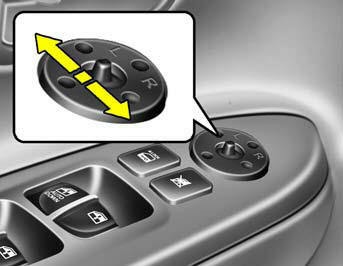 Move the selecting switch to the right or left to activate the adjustable mechanism for the corresponding door mirror. 2. Adjust mirror angle by depressing the appropriate directional switch as illustrated. o Do not operate the switch continuously for an unnecessary length of time. o Scraping ice from the mirror face could cause permanent damage. To remove any ice, use a sponge, soft cloth or approved de-icer. Be careful when judging the size or distance of any object seen in the passenger side rearview mirror. It is a convex mirror with a curved surface. Any objects seen in this mirror are closer than they appear.